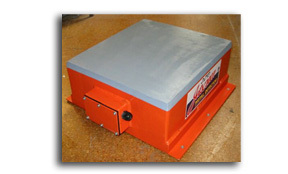 The flat detector head is designed to sit just beneath the conveyor belt and can be made to match the width of the belt in order to ensure reliable operation. The flat head is a popular option as they are simple to install and, although less sensitive than the other styles of heads, prove more than adequate for many applications. As the head sits beneath the conveyor belt, it is not necessary to cut the belt when installing, and provided the head is located sufficiently clear of any other metal work can perform very well. The position of the mounting brackets and junction box can be designed to suit the individual needs of the client.